What a fabulous start to the preamble this week, harking back to the days of mathematical puzzles by Rhombus. I have to admit that they always seemed far too mathematical, and I tended to give them a wide berth. I wondered if this would be more gentle. That was it! No wonder I gave them short shrift. However, if your shrift isn’t so short, the puzzle is at the end of this blog, and I hope you enjoy it. I was a bit worried by the title of Oyler’s offering. Rather than Can You Do Division? — II, he called it Can’t You Do Division? It was almost as though he was looking down his nose at me and challenging me to succeed! With a crossword, there are normally many ways into the puzzle. The trick with a mathematical is finding the one way in, as I think I’ve said before. [Yes, you have. Ed.] This week, I started off by expanding the information provided by the preamble. If a number has 2 factors, it is prime. If it has 3, it is a square. If it has 4, it is the product of two primes or a cube. If it has 5, it is a fourth power. Despite this last note, I failed to realise that any number with an odd number of factors is a square. 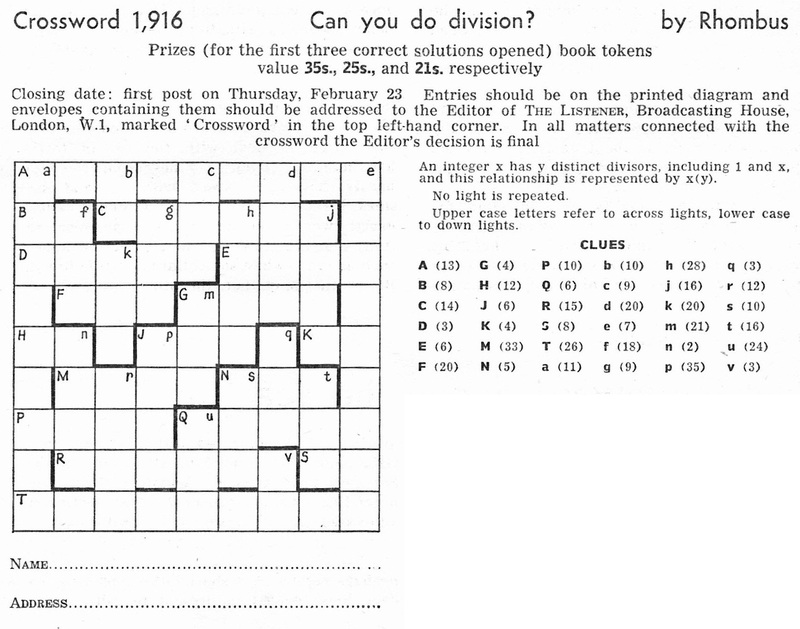 (I know this because Oyler has just sent me his setter’s blog for the puzzle!) I’m not sure this would have helped particularly since, for example, m (21) was either 22×36 or 26×32. The first was too big, 2916, but the second was just right, 576. Before that, I got S (5) which had to begin 1, 3, 7, 9 (t (2) is prime), so had to be 16 (24) rather than 81 (34). After that, K (7) was 64 and then p (35). (4+1)×(6+1) = 35, so we had a fourth power times a sixth power which was either 16×729 or 81×64. This first was too big (11664), so it was 5184. After that, I homed in on q, u, J, G, N, c, s, etc, etc. There were a couple of minor hold-ups but all in all, a reasonably quick solve just short of three hours. I must admit that without a calculator I’d have been at a loss. The Listener web site mathematical appendix does have a list of factors for all numbers up to 1000, and that proved extremely useful, but I did need to use Wolfram to check the primeness of Q 14657 and C 428137! 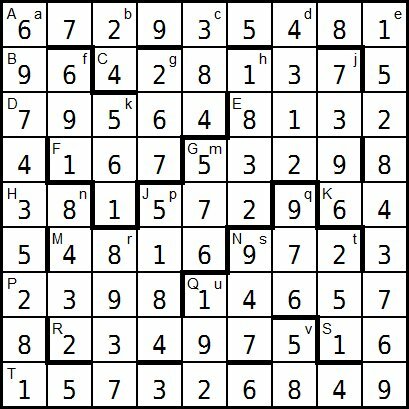 Plus, and you’ll note that it is missing from Rhombus’s puzzle, every row and column contained all the digits 1–9. This certainly sped up the last few entries for me; indeed, some of the clues didn’t actually need solving. Of course, one of my last tasks was to solve them just to make sure. 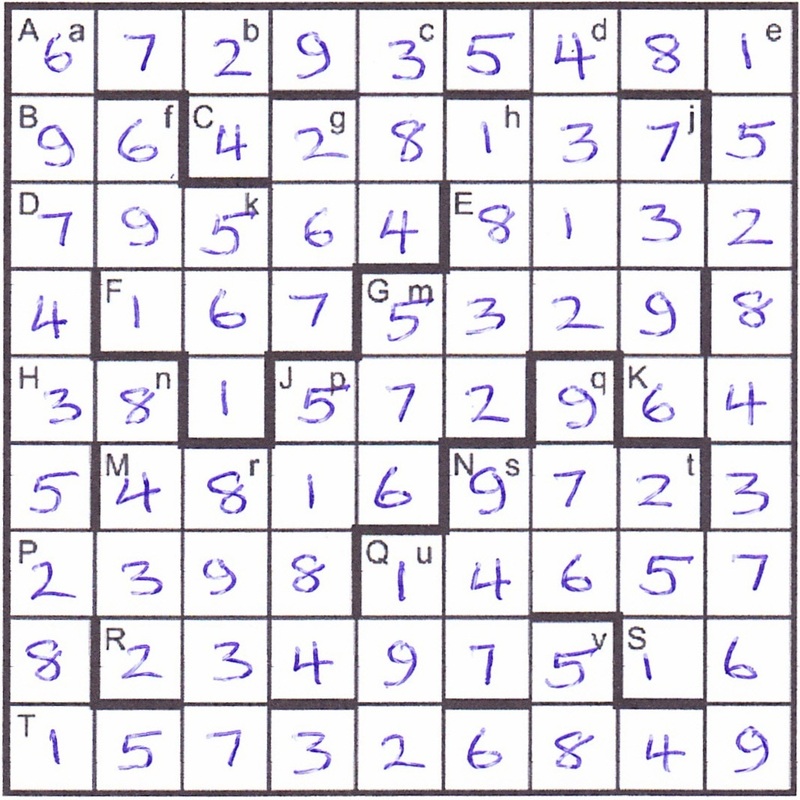 Even the squares in the perimeter didn’t need much work since the unchecked cells all came out in the pandigital wash. So special thanks to Oyler and/or the editors for making the puzzle slightly more understandable for the likes of me. The explanation in the preamble certainly helped make it a fairly straightforward solve. This entry was posted on 10 March 2017 at 4:00 pm	and is filed under Solving Blogs. Tagged: Can't You Do Division, Oyler. You can follow any responses to this entry through the RSS 2.0 feed. You can leave a response, or trackback from your own site.